Shimmerz Paints is swapping with Impression Obsession - what a perfect pair.... Impression Obession has a wide variety of images and totally "work" with all the Shimmerz Paints' products. 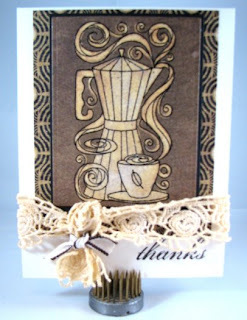 I was able to use this wonderful "Coffee Aroma" image. My first sample is pretty straight forward for the main focal point. Stamped and colored with COPICS and then highlighted with Shimmerz' "Candle Light" and "Fire Engine Red" paints. The band mat is where the fun begins. I took a coffee wrap (cardboard) and smooched it into a blend of Tim Hotz "Brick Red" distress ink, "Barn Door" Shimmerz Spritz, and "Fire Engine Red" Shimmerz Paint. 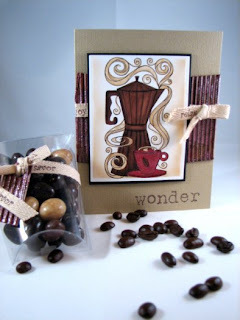 I got some little "Buzz Beans" (love those chocolate covered coffee beans!!! - yum) and put in an acetate pillow pouch (die cut from Creative Cuts & More), wrapped a little ribbon, with some leftover coffee wrap (cardboard). There's a little closer look at all that Shimmerz effect. 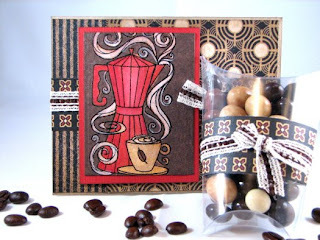 My next two samples use the same "Coffee Aroma" image from IO and a technique I learned from PatStamps "Technique Junkies" newsletter. Look at that YUMMY Graphic 45 paper!!!! yum, yum... Both samples use "Candle Light" Shimmerz Paint on the steam-aroma in the main image. I also painted the lace on the second card with "Candle Light" - each got a little spritz of "Baby's Breath" Shimmerz Spritz....on the background. For the main image I sprayed fine quality watercolor paper with "Espresso" Color Wash (Ranger) with an Shimmerz Spritz overspray using "Mud Pie" (on the first sample) and "Truffle" (on the second. After drying stamped image and embossed with black detail EP, then used the "Technique Junkies" bleached technique. For the first sample I colored using "Brick Red" Distress Ink (Tim Holtz). For the second image no coloring, except for a little "Candle Light" Shimmerz Paint. What a beautiful image! I love all the different ways you used it! All I cam say is Wow! What a great batch of coffee. Each card is just beautful and full of Aroma visually. Lovely cards! 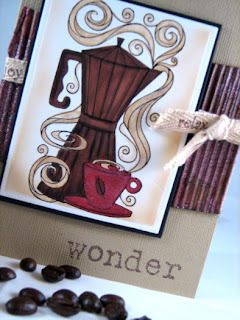 I wish we had some where in town to get coffee :( I love the coffee theme anytime!! Looks great with the Graphic 45 papers! !